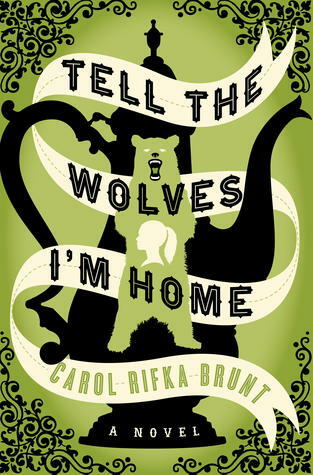 Tell the Wolves I’m Home by Carol Rifka Brunt. Dial Press, 2012. Currently Available. Face Value: I love this cover. I love it so much that I want a print of it to put up on my wall. I love the teapot, I love the font and the wolf and the girl’s silhouette. It’s a piece of art that evokes both the literal story and the emotional tone of the book. I was totally proud to be reading this in the public airport setting (at least until I started crying my eyes out and had to hide awkwardly behind my cardigan). I suppose I have the fact that this book was published as an adult title to thank for this classy cover. Nice to be spared an image of June’s torso looking longingly out at a cityscape or something. Does it Break the Slate? YES YES YES YES YES. This is a book that features Slatebreaking characters at moments of transition in their lives, when they have to figure out how to go from being girls to being women. Both June and Greta are Slatebreakers in their own way. It’s also an important story about a moment in our history that we don’t see talked about that much. Shedding light on what it was like to be a gay man with AIDS in the 1980s is an important perspective that I’d like to see more of. Who would we give it to? This is another book for sisters. The strained relationship between Greta and June will resonate with almost anyone who has a sister and was a teenager. But also this is a book about mentors and family, and growing up and grieving and taking care of other people. This is a rich, loving book for humans of all kinds. Review: June Elbus is fourteen years old and grieving. It’s 1987 and her beloved uncle and godfather Finn has just died of AIDS. Since it’s 1987, this is something people just don’t talk about. Her whole family – her mom, who was Finn’s sister, her dad, and her big sister Greta are all grieving in their own way, but June was particularly close to Finn, and feels like no one else can really understand what she’s going through. So when Toby – Finn’s partner that she never knew anything about – reaches out to her, she’s drawn to this person who knew Finn in a way that she didn’t and is feeling his loss just as much. Technically, this is not a YA book. It was published as an adult title, and obviously, I think that it is a great book for adults! I am an adult! I loved it! I think my mom would love it! And so on. But it’s interesting to look at a book like this, that is so internal, that is so focused inside the mind of a fourteen year old, and try to figure out what makes this a book for grown ups and something like Code Name Verity, about 20 year olds fighting in a war, YA. Curious. Regardless of the politics of publishing though, I loved this book, and I’m reviewing it here because I think that it is a beautiful amazing book that young people would really get a lot out of. First of all, I loved these characters so deeply. At its core, this is a book about relationships – June’s relationship with Finn is held up as an ideal, so when she realizes that she was kept apart from so much of his life it adds a whole new layer to her grief. And her relationship with Toby gives both June and Toby the chance to grieve together and take care of someone else. But the relationship between the sisters is just as essential as June’s relationship with Finn and Toby. June is an outsider – she doesn’t really have friends her own age and she’s the kind of 14 year old who is both really mature and really immature for her age. She wears Renaissance Faire boots every day and still plays make believe in the woods. Greta, on the other hand, is growing up fast. Where June’s insecurities play out in shyness, Greta’s play out in performance, demonstrating to the world that she’s fine, better than fine, even when she’s not. Greta begrudges June’s close relationship with Finn, June resents Greta’s harshness. The two of them play out in sharp contrast in their approach to the world and to their loss. But one of the most important parts of the book is the relationship between these sisters. Watching them come together, in small but meaningful ways over the course of the book is one of its strongest Slatebreaking elements. We see June grow up, and become willing to face hard truths. And we see Greta become able to articulate what she wants and figure out how to ask for it. “My sister, Greta, and I were having our portrait painted by our uncle Finn that afternoon because he knew he was dying. This was after I understood that I wasn’t going to grow up and move into his apartment and live there with him for the rest of my life. After I stopped believing that the AIDS thing was all some kind of big mistake. When he first asked, my mother said no. She said there was something macabre about it. When she thought of the two of us sitting in Finn’s apartment with its huge windows and the scent of lavender and orange, when she thought of him looking at us like it might be the last time he would see us, she couldn’t bear it. And she said, it was a long drive from northern Westchester all the way into Manhattan. She crossed her arms over her chest, looked right into Finn’s bird-blue eyes, and told him, it was just hard to find the time these days. ‘Tell me about it,’ he said. Read that paragraph, and just try to tell me you aren’t hooked. From a historical point of view, this is a super important story to be told, and a part of history that we just don’t see depicted all that much. The only YA book I can think of that really addresses AIDS in the gay community in the 1980s is Peg Kerr’s The Wild Swans (if you know other good ones, please leave them in the comments!) But reading this story is a stark reminder of how bad things were, both in terms of medicine – AIDS was almost certainly a death sentence then – and homophobia. By no means are things perfect now, but we’ve really come a long way in the past 25 years. I’d love to see more books that give us insight into what life was like during that time, especially if they’re books that give us such a richly realized and generous account. This entry was posted in Reviews, Young Adult and tagged AIDS, Art, Family, Grief, LGBTQ, New York City, Realism, Sisters. Bookmark the permalink. Love this review. Can’t wait to read this book!! Loved your review. I have 70 pages left of this book and I’m a little scared to finish (mostly to find out what is happening with Greta), but I really enjoyed reading your review of it all. Thank you!